Paul telling Jim that it's good to have him back. Helen telling Jim that Beverly tried to ring him in New York but the ‘phone was answered by a woman in his hotel room at 6 in the morning. Jim retorting that it's none of Helen's business. Joe is complaining to Matt about the fact that Ryan is completely useless as a gardener. Kerry walks in, looking despondent, and Joe asks her how she went today. KERRY (sighs): Great. I did $15 for a full day's work. Matt points out that it was only her first day; it'll get better. Joe tells her that her stuff's great, but there might be a few people out there who consider it a little bit ‘arty'. Kerry retorts that it's jewellery; what's it *supposed* to look like? She goes on that what she needs is the gift of the gab. Matt suggests that she gets Eddie to give her a hand. MATT: He reckons he used to spruik in Petticoat Lane. Joe looks at him blankly. MATT: London – you know?! Kerry nods that that's not a bad idea. The next morning, Kerry and Beverly emerge from a back room of the apartment, Beverly telling Kerry as they do so that both she and the baby are in great shape. She offers Kerry coffee, but Kerry declines, saying herbal tea is better for you. Beverly makes that instead! Kerry then asks Beverly if she's talked things out with Jim yet. Beverly sighs that she'd bankrupt herself with the ‘phone bill. KERRY: Not to Ramsay Street you wouldn't. BEVERLY (snaps): Charming. Pity he couldn't find the time to contact me. KERRY: You will tell him that you're pregnant when he sees you? BEVERLY: *If* he sees me. KERRY: You *will* tell him? BEVERLY: That will depend entirely on what Jim decides about *us*. BEVERLY: He has to make a decision without knowing about the baby. He has to make some sort of commitment to *me*. Kerry points out that Jim does have a right to know he's going to be a father again. Joe is looking out through the lounge room window at the trees outside. He then tells Dorothy that he can give it a chop this arvo. Ryan walks in and Dorothy tells him that Joe is chopping down one of their trees this afternoon – and Ryan can give him a hand. Joe quickly says that this is no job for a beginner. Dorothy tells him to find something for Ryan to do, then: she and Ryan anticipated that Ryan working for Joe would be some kind of *learning* process. DOROTHY: As far as I'm concerned, if one party if appears to be reneging on the agreement then the other party can find someone else to chop down her tree. Joe quickly tells Ryan that he can plant some daffs. He heads off. Matt is sitting in his bell-hop's uniform when Jim comes in and joins him at his table. MATT (bitterly): Well, it's invaluable experience for an apprentice mechanic. Jim apologises for going away and disrupting Matt's training – but he then warns Matt that there's a good chance he won't be able to complete his apprenticeship. He explains that Paul is considering leasing the workshop to a chain of auto electricians. MATT (sourly): Things just get better and better, don't they? Kerry comes into the coffee shop and walks across to the counter. Eddie is standing behind it and Kerry says to him that she heard he did a bit of spruiking down at Petticoat Lane markets. EDDIE: Certainly did – for quite a few months. Good at it too, I was! Kerry explains that she's renting a stall at the local market and her sales pitch is about as enticing as a eulogy! She asks for a few tips. Eddie smiles that it would be his pleasure. Jim joins Kerry at the counter and orders a coffee from Eddie. Kerry asks Jim coolly how his holiday was. JIM: Well fine... although I don't know why everyone keeps calling it a holiday: I was over there to work. KERRY: Oh. Have you seen Bev, yet? KERRY: She was pretty upset when you left. JIM (shrugs): I went about it the wrong way, I guess. KERRY: Well I hope you can get together soon. JIM: We will – we have a lot to talk about. Kerry heads off, leaving Jim looking thoughtful. Ryan is planting daffodil bulbs, but Joe, looking incredulous, stares at him and tells him that he's planted them all upside down! He says he'll take over. 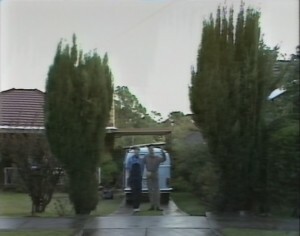 He then leads Ryan across to two tall pine trees standing either side of the driveway. JOE: See these pines? I want you to take your green thumbs, get the trimmer and trim ‘em, OK? Then get the ladder, go up and even them up. No worries? KERRY: What am I doing? Nobody wants to be lectured at a market, do they?! 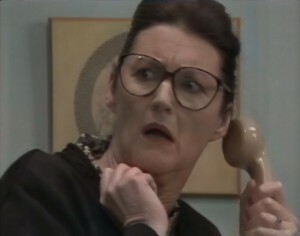 Eddie rocks up at that moment and tells her that she's got some lovely stuff on her table. He looks across at the salesman delivering his pitch and attracting a lot of people. Kerry mutters to Eddie that that guy is terrific. Eddie, however, insists that he's strictly small potatoes. He tells Kerry to wait and see what happens when he gets a bit of his own medicine. KERRY (uncertainly): Me? Oh Eddie... I don't think I *can*. EDDIE: Ladies and gents, guys and girls. Hear ye, hear ye, hear ye! People turn to look at him. Kerry smiles delightedly. Jim has turned up. He apologises for not being round earlier; he had a few problems with the workshop. She then comments on Jim's outfit: a grey shirt, blue jeans and a baseball jacket. BEVERLY: Have you dressed up especially to see me or is this a new image? JIM (shrugs): Bit of both. BEVERLY: Quite a quantum leap for you! They sit down at the table and Beverly tells Jim about completing her research project and Ewan taking a position in Perth. Jim comments that it's a bit of a luxury for her to have time on her hands. Beverly tells him that she's still serious about the practice. She then asks him if he's going to re-open the workshop. Jim tells her that he thinks it's time he got back to what he really wants to do. JIM: I'm an engineer, Beverly, not a mechanic. Ryan is up a ladder, pruning the pine trees. Joe is mowing the back lawn, singing loudly as he does so! Ryan turns off the chainsaw he's using and climbs down the ladder. He takes a few paces back and looks to see how the trees are coming along. 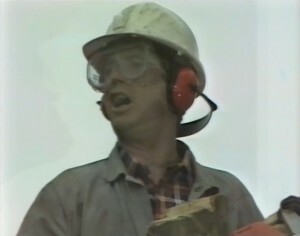 An expression of horror crosses his face as he realises he's pruned a good foot or more off one tree than the other! He starts work on the taller tree again – then reviews things once more and finds that that tree is now considerably shorter than the first one! He has another go at the first one! A while later, Ryan walks over to where Joe is washing down the lawnmower in the back garden. RYAN: Anything else you want me to do? JOE: All right – better come and have a look, then. He walks round to the front of the house – and stop in his tracks! He then looks at Ryan in shock before running over to the pines: one is now about six foot tall and the other about four foot! JOE (aghast! ): What have you done? These are pines, matey, pine! They're not bonsais! Eddie is still spruiking, telling the customers that Kerry only sells the most unique goods for the customer. He breaks off and turns to Kerry. KERRY (happily): I've made more since you've been here than I have all day! Eddie then suggests that *she* give it a go. JOE: Fair dinkum,Dot. If your nephew is a gardener, I'm a nuclear physician! JOE: Oh yeah, that too! All I told him to do was trim a couple of pine. JOE: Too right he did: to the point where the place looks like it's full of Munchkins! DOROTHY (curtly): You obviously failed to instruct him correctly. Ryan walks in as Dorothy accuses Joe of implying that Ryan's behaviour was wilful. She tells him to apologise to the boy. Ryan, however, insists that there's no reason for Joe to apologise. He then suggests that maybe Joe explained and he didn't listen. He pleads for another chance. Joe, however, sighs that he's not sure he can afford to. Ryan insists that he'll listen, and if there's any doubt in his mind, he'll ask. Joe sighs that he'll have to think about it over a cold glass. As he goes to walk off, Dorothy reminds him that he said he'd get rid of her tree. Ryan says quickly that he'll give Joe a hand. Joe looks horrified! Kerry is addressing the crowd, but they're just milling around. KERRY: Hello, everyone. I have some really terrific items here for the discerning shopper. SALESMAN: Still plenty of bargains left over here, ladies and gentlemen, although you'd hardly believe it at these prices. Eddie urges Kerry to fight fire with fire. KERRY: We've got something special for the somebody special in your life, and we'd really love to have your company. SALESMAN (to Kerry): Yeah – before you die of loneliness, eh, darling?! EDDIE (to Kerry): Use it, Kerry; show him who's boss. KERRY (to the crowd): If you haven't yet had a look at our stall then you don't know what you're missing. 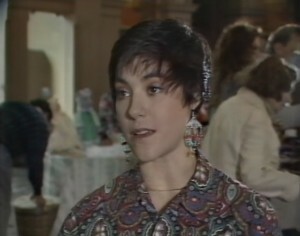 SALESMAN (to the crowd): Gold and silver bracelets, ladies and gentlemen; bangles, baubles and earrings. KERRY (to the crowd): Have a look at our all-original, handmade, all-Australian items of jewellery, all at very competitive prices and all environment-friendly. The crowd starts to gravitate towards Kerry. Eddie smiles as he wraps up another sale. Kerry looks at him delightedly. JIM: Oh, you know what it's like: new city... especially a city the size of New York. BEVERLY (coolly): Well that's *your* future. Do *we* have a future together, Jim? JIM: That depends, I think, on whether we're able to be open with each other. BEVERLY: So... be open with me. JIM: There are a lot of things that have remained unsaid between us; we've got to stop covering up. JIM: What's *that* supposed to mean? BEVERLY: How open are you being? Is there, for instance, something specific you'd like to tell me about New York? JIM: I've already told you. JIM (shrugs): Apart from which movies I went to see. What *is* this? BEVERLY: You're right, Jim: we should be more honest – both of us. JIM: Well what? You're starting to sound like a parrot, here. If you've got something to accuse me of specifically, please get it off your chest. BEVERLY: Not at this point. JIM: Oh. All right. Well, let me know when. With that, he heads off, leaving Beverly looking upset. JOE: There's a lot of mathematics and science and physics and biology involved in this process, mate. You don't just get an axe and go at it hammer and tongs. JOE: It's a figure of speech, mate. You've got to analyse the height, estimate the weight, take into consideration the branch spread, and prevailing winds. He holds a finger up in the air. Matt suddenly walks over to Ryan and asks where Joe is. Ryan points him out up the tree. Toby walks up to Joe, who's just descending the ladder again. TOBY: You're going to chop it down, dad? Great! JOE (self-importantly): I'm going to surgically remove it from the premises. RYAN: Shouldn't you secure it with rope or something? JOE: No way, mate, that's for amateurs! He climbs the ladder again, holding a chainsaw. He starts it up and makes a first cut into the tree. Ryan, Matt and Toby stand and watch. Inside the house, Dorothy is standing in the hallway, talking on the ‘phone. Outside, the tree begins to fall. Everyone outside watches in astonishment at the direction the falling tree is heading in. Inside, there's a smash of glass as the falling tree crashes in through the lounge room window. In the hallway, Dorothy stands and stares at the mess, an expression of horrified astonishment on her face!